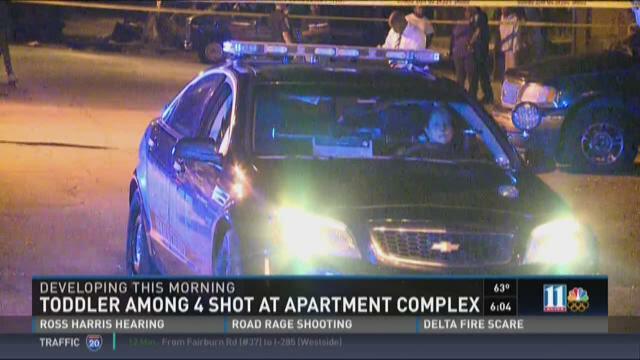 DECATUR, Ga. -- A toddler was among four people shot when someone opened fire at an apartment complex in DeKalb County. Reports of the incident, which happened in the 4300 block of Glenwood Road, first came into the newsroom around 8:30 p.m. Monday. The suspect allegedly walked up and began shooting at a group of people. Authorities on the scene said the victims included two adult men, a woman and a toddler. 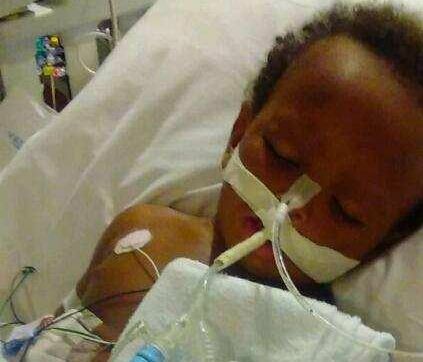 According to authorities, the child, D'onte Patterson II, was taken to Children's Healthcare of Atlanta at Egleston. He was out of surgery late Tuesday morning, in stable condition and expected to survive. "The little baby, he was precious, he knew me, he always hugged me, he always run up to me," one woman at the location said. DeKalb County Assistant Police Chief Cornelius Yarbor said the department wouldn't stand for incidents like these. "You have an individual who was willing to take a shot and hit and shoot indiscriminately into a group of people and hit a child. This is something that the DeKalb Police is really not going to tolerate," he said. Two of the adults have been taken to Atlanta Medical Center while another is at Grady.